The M.V. Deerleap gets a new heart! 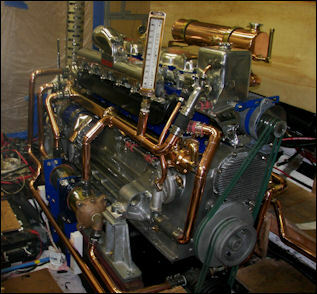 The deerleap was origianally powered by twin Hall Scott gas engines. Under conscription with Canadian Navy she was fitted with Vivian diesels. After being de-commisioned from her war time service Campbell Church installed the 671 Detroit diesels, sometime around 1948. She has had them ever since. After almost 60 years of service the old "jimmies" were getting tired. 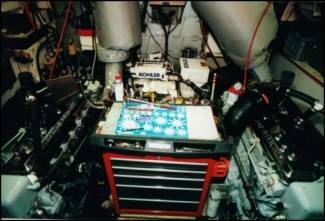 Rebuilding them was ruled out quickly - these engines were known for being loud, inefficient and leaking oil horribly. Slim decided it was time to consider options for replacing them. A number of engines were considered, including: John Deere, Catapiller, and Cummings. In 2004 Slim happened to hear Gardner engines run for the first time. He was amazed at how quietly they ran. Later that year he met and with Paul Gardner at the Victoria Wodden Boat Festival. After learning more about them, he decided these were the engines that would best complement the Deerleap. Finding the engines, transmissions, parts, and a competent mechanic for them, turned out to be a whole new adventure. 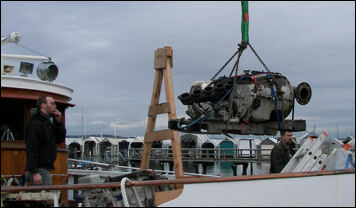 The engines were finally located, and were shipped to an experienced mechanic in Canada. 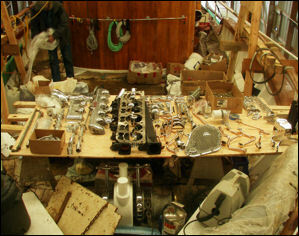 After being completely torn down and rebuilt, the engines were again disassembled and shipped for re-assembly aboard the Deerleap. Prior to installation the hundreds of parts were custom painted and/or polished. The end result is not just "new" engines, but beautiful improvement of this impeccably restored piece of history.